Created and performed by Silas Riener. Lighting design by Davison Scandrett. Music composed by Jesse Stiles. Blue Name is a project exploring the human body as multi-modal instrument capable of expression in many mediums and modalities simultaneously. It is an investigation into the language of dance, and the pure communicative power of movement. This is a solo show of dances compiled over 18 month of investigating what it means to dance in front of people and to share an experience of being alive in the world. The score makes use of Kinect depth sensors to interpret Silas Riener’s (Choreographer/Dancer) movement and interpolates between various sound states using machine learning algorithms. Blue Name explores the creative potential of many emerging technologies, including real-time motion capture, depth sensing, skeleton tracking, three dimensional sound synthesis, real-time video mapping, and experimental costume design. By developing interfaces between emerging computer vision technologies and real-time software for musical synthesis, video projection, and control of architectural lighting, it allows the artists to create multimedia dance works wherein the creative process is coextensive – the work of the composer, choreographer, and scenic artists (video, lighting) are inherently mutually informative. Blue Name represents a powerful departure from the traditional hierarchical relationships that place choreography below music, and decor below choreography. 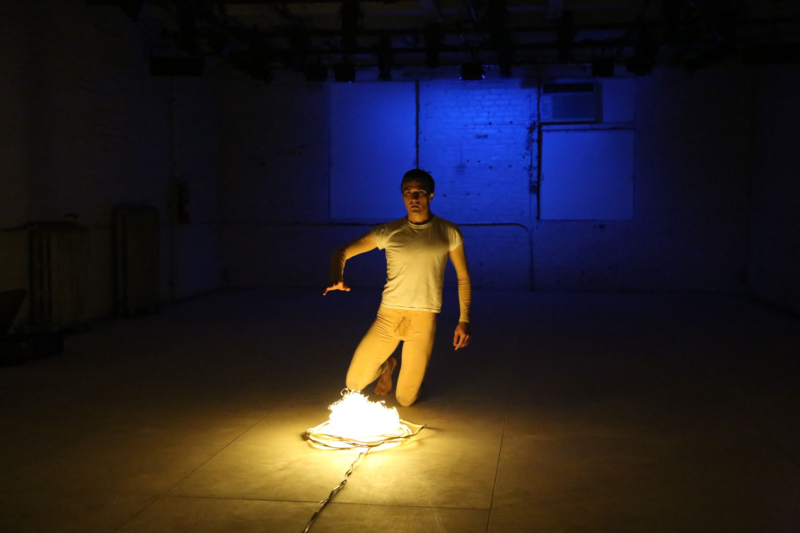 With an opposite approach to the twentieth centuries pioneers such as Merce Cunningham, John Cage, and Robert Rauschenberg who challenged these same structures by creating works wherein the dance, music, and decor were each created independently, Silas Riener literally embodies the music, video, and lighting. In addition to the funding support from Gibney Dance-in-Process residency, Princeton University, the Mertz Gilmore Foundation, Late Stage Production Stipend, the Jerome Foundation, and the Chocolate Factory, Blue Name was created with support from a regular grant from the Frank-Ratchye Fund for Art @ the Frontier (FRFAF) — an endowment founded to encourage the creation of innovative artworks by the faculty, students and staff of Carnegie Mellon University. With this fund, the STUDIO seeks to develop a cache of groundbreaking projects created at CMU — works that can be described as “thinking at the edges” of the intersection of disciplines.